Back in October of 1996, shortly after I started collecting in person signed baseballs from world leaders, former Secretary General of the USSR Mikhail Gorbachev published his memoirs. As part of his agreement with his publisher, Gorbachev held two book signings in the United States; his first stop was in New York at the Barnes and Noble Booksellers on Fifth Avenue. It was the first book signing I had ever attended with a dignitary of his stature. I arrived at 6:00am; the signing was at noon. I think that if this was held today – you would need to camp out for two days to meet such a historic and reclusive person. I was the tenth person in line so I knew I had a chance of at least meeting him and getting a book signed. But a signed book was not what I was after. I stood on line with a baseball in my pocket hoping that I could add a signed baseball from Mr. Gorbachev to my collection, which was still in its infancy. I knew that the New York City Police, the store security and the U.S. State Department detail would be there in force, so I needed an “edge.’ The night before, I had called an acquaintance who spoke fluent Russian, and he taught me a bit of phonetic Russian on the phone. I immediately memorized the passage and I was prepared! 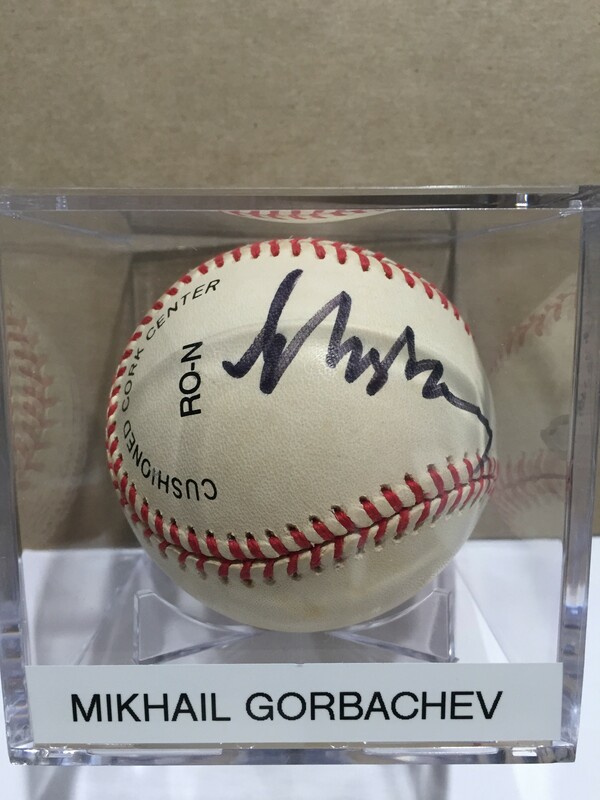 Many of my friends, as well as some folks on the book signing line, told me I had no chance of getting Mr. Gorbachev to sign a baseball – but I had an ace up my sleeve! When it came time to actually approach Mr. Gorbachev, security was very tight, and only one book was allowed per person at the signing table. When my turn came, I immediately started reciting the passage I had memorized the night before. Mr. Gorbachev smiled and signed my book. Simultaneously I took the baseball from my jacket pocket and proceeded to hand it to him. Security rushed to grab my hand and pull the ball away. In a very statesman-like manner, the former leader of the USSR stood up and gently shoved the store security guard out of the way, grabbed my baseball and sat back down. He signed it beautifully, then stood up and handed it back and finally bowed to me. I thanked him and shook his hand. The crowd applauded! What astory for the ages.